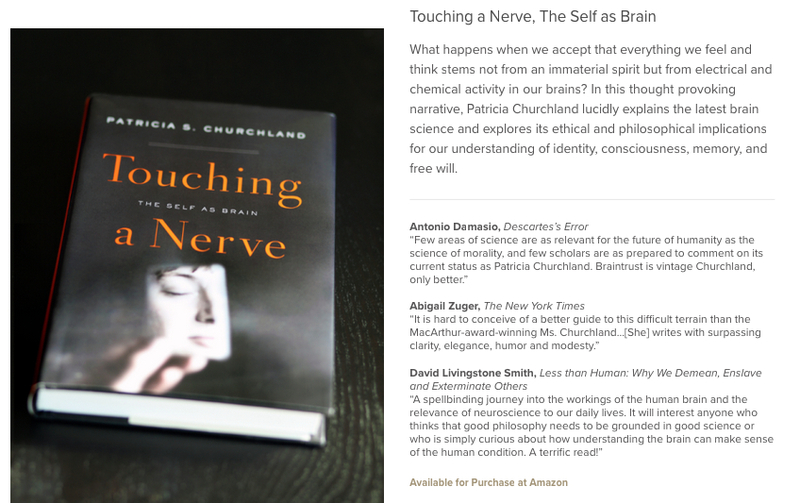 For this post I have transcribed a 15 minute audio/podcast interview conducted by the Nature science journal with Professor Churchland about her book ‘Touching a Nerve‘ – as there seems to me a perfect synergy with this and the reluctance of psychology models to bend and be flexible to reality and modern science – this is a perfect ‘think piece’ for anybody exploring best practice models to understand why and how we think and feel and behave the way we do. Enjoy! The following interview was conducted by Nature (the international interdisciplinary journal of science) – and is available on their collection of podcasts HERE – Professor Churchland’s website is HERE – and the Amazon link for the book is HERE. Churchland: The motivation came from mostly undergraduates, who I would teach, and in courses called such things as Philosophy of Neuroscience, and when we would go for coffee afterward they would tell me how excited they were about all these things, and how remarkable the results were and so forth, but inevitably we sort of meandered down to a very personal level where they would say things like “Doesn’t it kind of freak you out that you are just your brain? Doesn’t that bother you?’ And so I began to kind of dwell on that with them a little bit, to try to pull out what was really bothering them. And I felt that as a philosopher I really should be able to address those questions, I should have some answer. Smith: I’m sure this can’t be a universally popular view among your colleagues in philosophy departments around the world. Do they react differently to that, what proportion of them would you say are sort of ‘materialist’ and happy with this view? Churchland: Well I think it’s hard to say because many philosophers who are ‘interested in the mind’ as they say, nonetheless don’t value neuroscience except for it’s clinical implications. And they want to try to understand the nature of the mind quite independently of understanding anything about the nature of the brain. Which seems to me to be a very peculiar thing to do, but I think that that is beginning to change amongst the younger generation, I think the older generation – people who got their degrees in the 70’s, 80’s, 90’s, and so forth – I think those people still have this idea that philosphy is fundamentally an a priori discipline, and that simply by virtue of reflection and conceptual analysis that they can set limits for science and that they can tell us what can and cannot be known. And I think that’s probably terribly misguided. Smith: I love the bits in the book, once at the beginning and once at the end, where you said you bumped into a philosopher at a conference, or they stood up and said, “I hate the brain, I hate the brain!”. And then you were in a lift with an anthropologist and they call you a reductionist as if it was a dirty word. How do you react to those kind of encounters? Churchland: Yes, well, the one where the guy stood up and hollered that he hated the brain… I mean… other people seemed not to be terribly bothered by it, in the sense that they seemed like well they could sort of share that view – I though it was the most anti-intellectual thing I’ve heard in my life [laughs], and bear in mind I’ve grown up in a redneck farming community! So that really did surprise me – and I think for him, what he really wanted to convey is the idea that neuroscience is encroaching on the way we think about ourselves in sort of psychological terms, and the answer is Yes it is, but there is much to be gained by that. Including insight. You know, the alchemists could have said the same thing about the chemists, right? But ultimately alchemy lost out, I mean it just didn’t have what it took, and I think a similar thing will happen with regard to neuroscience. So anyway, I think there is still, within philosophy departments, tremendous resistance to knowing and understanding and working with science. Smith: And drilling down into how that kind of collaboration might work, because maybe that’s one of the things you wanted to come out of this book… is to get people to kind of work on these topics a little more together… what does a neuro-scientific informed philosophical theory look like? Churchland: Well, let me see if I can answer that by coming at it from a slightly different direction. If a question is about whether or not we have free will, where at least in part that means is it acceptable to hold people responsible for their behaviour, then at least in part what we want to know is what’s the difference in the brain between someone who does have self-control, and someone who does not. And so whatever the answer is to that question about holding people responsible, it will be both neurobiological and it will also be philosophical in any sense that one might care about. But think about it this way, the chemists in the middle ages thought of themselves as natural philosophers, and so indeed they were, and so you might ask well what would be philosophical theory of the nature of matter? Well it’s not really philosophical any more at some point, right? It’s chemistry, and it’s physics, and it’s electricity and so forth. and I think that some of the questions are going to turn out to be fundamentally empirical questions. If we want to know about the nature of the mechanisms for consciousness, it’s not going to be philosophical in any old fashioned sense, it’s going to be an empirical theory. Churchland: Well, I think there are many things that philosophers can do… here’s an analogy that I don’t want to make too much of as I think there are weaknesses in it, but you know within physics there are theoretical physicists who use the data from the experimental physicists to constrain theories, but then they also use other tools to try to make theories that fit the facts. And I think that there is a role, and some philosophers are quite suited to that role, that’s a little bit analogous to theoretical physics… sort of theoretical neuroscience, but they can’t hope to do it if they don’t know anything. The philosophers who will be out of a job are those who imagine that they can solve problems about the nature of the mind simply by reflection and by paying attention to language, it ain’t going to happen. Smith: Changing tack slightly, you’ve had various reaction to the fact that you use a lot of your personal experience in your upbringing to illustrate points within the book. What made you do that? Churchland: Well, I think I felt that if I was going to address the fears and anxieties people have about developments in neuroscience – the ambivalence that on one hand they find it very appealing, and on the other hand they find it faintly unnerving – if I was going to address that in a way that made people understand why I was comfortable, that I would then have to give something of myself. And the part of myself that I really wanted to convey I guess really has do with the practical world and making sense of reality, when that really is where the facts are taking you. As I’m sure you can tell, [laughs], I’m very impatient with ideology, I’m very impatient with, you know, sort of romanticism. I’m impatient with the idea that you can just manufacture ideas and be taken seriously and so forth… that ultimately you really have to pay the piper, you really have to make your peace with reality. And so I wanted to sort of convey that in the only way that I knew how. Other people would do it, I’m sure, in a different way. Churchland: Yes, that’s right, and sense of self… I think that sense of self is particularly interesting, I mean it should be interesting to philosophers at least for this reason: John Locke, who is much revered for many things, but he got some things very wrong, and one of the things he got wrong was the idea that our sense of self really does depend on our autobiographical memory, that if that were lost that we would not have a sense of self – and of course that turns out to be completely wrong. We now know that there people who are completely amnesiac, anterograde amnesics who cannot learn anything new, but also amnesics who have lost their memory for all of their autobiographical details, and yet they have a significant sense of self – they’ve lost some sense of self, but there’s much else of course that they feel, and they maintain many social skills, they know how to interact with people, and so forth. And I think what’s important about this is two things – one is it makes us realise that sense of self is a brain construct, it’s something that your brain does. And that it has parts, and the parts are dissociable, and that one part has to do with autobiographical memory, but another part has to do with the spacial organisation of your body, where your limbs are and so forth, and another one of course has to do with your ongoing experiences, and your appreciation of what you can and can’t do, the so called ‘meta-cognition’, and those are all components of self, which seem to us as we live to be a single unified thing, but that’s just one of those wonderful illusions that the brain creates for us so that we can get around. Smith: Which piece of neuroscience or which kind of area has been of most use to philosophers like yourself who are neuro-friendly over the past few years? What area has made philosophers sit up and go ‘oh that could be helpful’? Churchland: I certainly found that evolutionary biology, together with a bit of an understanding of the evolution of the mammalian brain, and the realisation that the mammalian brain really is organised for attachment to offspring, that that was really really important for me in coming to understand the platform for morality. I mean it’s not the whole story of morality because of course we learn a lot once we are born, and we also problem solve, which means that we change the social practices and the social institutions of our group and so forth. But I think that once you understand the evolutionary basis, the biological platform for morality, it gives you a very very different perspective on it. Smith: That’s not even really been neuroscience though has it? Churchland: Well it’s neuro-endocrinology I suppose, although you’re right, Darwin did appreciate that attachment of parent to offspring was undoubtedly going to be a critical factor in explaining morality, I mean I thought it was amazing that he was so terribly terribly observant.